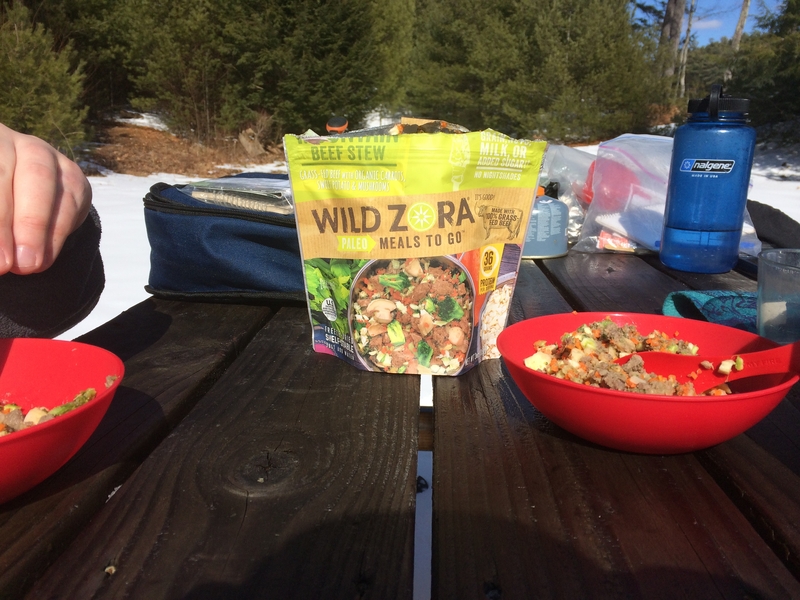 In the burgeoning world of backpacking haute cuisine, Wild Zora deserves a shout-out for its emphasis on healthy meals and snacks that address many of the food allergens common in Americans’ diets. Gluten. Soy. Dairy. Nuts. Ingredients in packaged foods popular on trail, but not part of Wild Zora’s dehydrated meals, snacks, and soups. The Paleo To Go Meals are dairy-free. The meat and veggie bars are nut-free, soy-free, and dairy-free. All are gluten-free. Wild Zora uses 100 percent grass-fed beef, and all the meat in its meals comes from free-range animals. But the attention to healthy, allergen-free products comes with a price. Wild Zora’s Paleo To Go Meals are $10.95 and $12.95; soups, about $2 in bulk; and snack bars are $2.65 each for a 42 pack bought online at Wild Zora. The company was started by Zora and Josh Tabin in 2014 in Loveland, CO, at first focusing on snack bars. Wild Zora expanded to meals in January 2018 with the purchase of Paleo Meals To Go. Then came Walmart’s offer last year for a one-year contract to sell Wild Zora’s snack bars in 1,000 of its stores, and the company doubled in size to fill the order. Wild Zora uses real food and spices in its products, according to the company’s website, while shunning preservatives and other additives. Wild Zora says it uses only 100 percent pasture-raised meat, raised without antibiotics or added hormones. Wild Zora products are also sold at REI and Amazon. I drafted my wife and son to help test Wild Zora’s products, and provide a range of taste opinions. Marge eats gluten-free, soy-free, and dairy-free, making her a perfect tester for Wild Zora’s products. Nate? Some might call him a fussy eater. Me? I eat pretty much everything. We started with the meat and veggie bars. We all liked the easy-to-chew consistency. No gooey gnawing and gnashing with these bars. The spices blended well, and gave the bars a flavorful taste. Nate, who doesn’t like spicy food, enjoyed the Chili Beef with cayenne, kale, and apricot. It has a zippy taste, but isn’t overpowering. Overall, we gave the bars an A for taste. They come two to a package, and Nate and I found two of them to be a satisfying morning snack while hiking. 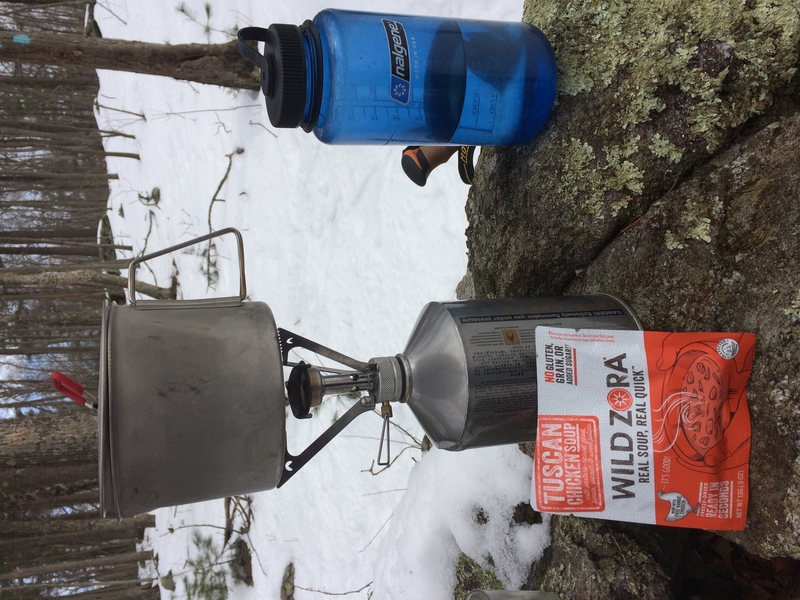 Nate and I tested the freeze-dried Mountain Beef Stew as our lunch during a day hike. The directions are loose: add about 1.5 cups of boiling water, seal the package, and let it rehydrate for five to 15 minutes, depending on altitude. I added exactly 1.5 cups, sealed the package, and set my phone timer to ten minutes. Because it was 39 degrees outside, I put the package inside an insulated lunch sack while the meal rehydrated. We liked the consistency. It had a crunch factor that you would expect of real food. It wasn’t mush. The meat looked and tasted as though it had been cooked on the stove. The herbs added a flavorful color. Nate, who doesn’t like mushrooms, ate all of them in the stew. The package says one serving, but after two snack bars each and half the stew package each, Nate and I felt comfortably full. I would say, though, that one person after a full day of backpacking would want the full serving. I tried the Cliffside Coconut Berry breakfast meal on another day hike. I added a cup of boiling water and waited ten minutes in 43-degree temperature. Again, the ten minutes was a median between the recommended five- to 15-minute rehydration time. The pecans and walnuts in the package were a welcome complement in a hot breakfast. The main ingredient is organic flaxseed meal, which is considered to be a good source of dietary fiber and omega-3 fatty acids. It’s also known as a stool softener, so there’s that to consider on trail. I can’t say that the blueberries and strawberries stood out, but the overall flavor was good. Wild Zora also makes soups, and the ones I tried were full of flavor, with rehydrated bits of meat and vegetables. Pour the mix in a cup, add boiling water, and you’re good to go. The flavors are good. Don’t expect a strong chicken or meat flavor; the spices do all the work here. And real veggies fill the broth, not noodles as filler. The following Wild Zora products are ones that I tested. Grass-fed beef with organic carrots, sweet potatoes, and mushrooms. The meat, sweet potatoes, and mushrooms rehydrated well, and looked and tasted like real food. A hearty breakfast. The pecans and walnuts stand out, while the strawberries, blueberries, apple, and mango seem to disappear in the oatmeal-like consistency of the organic flaxseed meal. With kale, cayenne, and apricot. A good zip to the taste, but not overpowering. With spinach, rosemary, and turmeric. We all liked the blend of spices. With tomato, pepper, and kale. The spices make the bar. Contains pasture-raised ghee, kale, cayenne, and red bell pepper. The cayenne gives this soup a hearty zip. It will certainly warm your taste buds on a cold day. And it has real chunks of beef. With pasture-raised ghee, tomato, spinach, and sweet potato. A nice variation on chicken soup. With carrots, green onion, and dill. The lemon stood out on this hearty chicken soup. Back to the gluten-free, dairy-free, soy-free component. Marge did not notice any intestinal discomfort after eating a snack bar. And Wild Zora says its production facility is gluten-free, thus avoiding cross-contamination. That’s an important consideration for people with allergies. No one wants to be caught on trail suffering from food that is causing them intestinal discomfort. The Paleo Meals To Go are high in protein, an important consideration for long-distance hikers. AT thru-hiker Brenda Braaten, who has a doctorate in nutritional biochemistry, says carbohydrates—which hikers gorge on—refuel muscles, while protein rebuilds them. Braaten, who runs Little Haven for thru-hikers on the PCT in Belden, CA, recommends 50 percent carbs, 35 percent fat, and 15 percent protein in hikers’ diets. 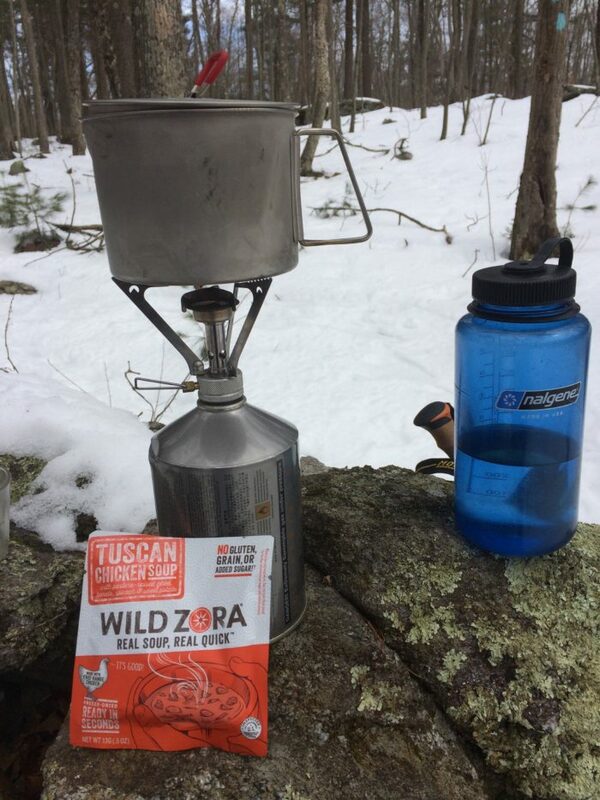 If you’re hiking a long-distance trail for five to six months, Wild Zora’s prices probably make its meals and snacks out of reach for most people to eat on a regular basis. But throwing a Wild Zora meal in occasionally to break up the monotony of bland trail food is certainly within reach. So would packing a few Wild Zora meals and snacks for a multiday hike. Wild Zora makes healthy, protein-heavy food that tastes good. The meals are easy to prepare, and rehydrate within about ten minutes. If you have to avoid gluten, dairy, or nuts in your food, Wild Zora fits the bill. And if you’re committed to free-range meat, real vegetables, and flavorful spices, Wild Zora checks off all those boxes. Wild Zora donated meals for purposes of this review. Love Wild Zora! I do mostly use them for quick trips due to cost. Their dinners work well with cold soaking, too, and still taste good cold!